The Applause™ portable hand wash sink is a self-contained, stand alone, two-station unit. Featuring a unique design where fresh water is stored in the main outer tank, and used water is stored in a 60 gallon capacity flexible vinyl liner. When the outer tank is filled with water, the inner liner floats up. When the foot pumps are activated, water drains from the sink bowl strainers into the inner liner that eventually displaces the water in the main outer tank. The sink with the hard inner liner Model SK3-2000 is ideal when capacity is not a factor. 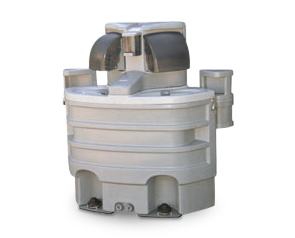 The hard inner liner has a fresh water capacity of 33 gallons, and a used water capacity of 34 gallons. Fresh water is stored in the main outer tank and gray water is stored in a hard inner liner. The water-mains hookup sink Model SK3-3000 must be hooked up to a fresh water source as well as a drain for used water. The sink is designed to hold a small amount of fresh water in the tank. The amount of water is controlled with a float operated valve. The water acts as a ballast, the more water allowed into the sink, the heavier the sink is. The sink basins are plumbed directly to a tee connected to the top fitting exiting the rear of the sink. The top fitting is for the used water connection and must be connected to a drain. The sink can be easily converted into a stand-alone sink by means of an optional flexible vinyl liner. The built-in recessed handles allow for easy transport, while the hinged lid provides convenient access to the internal components. The three ribbed design provides strength and offers space for "strip" advertisements which can be an additional source of revenue from special event sponsors. Two sinks can be placed back-to-back to create a service island. These sinks are supplied fully assembled. All materials, including resin, pigments and additives used to make the plastic components as well as the plumbing components that come in contact with the fresh water supply are U.S. Government Food & Drug Administration (FDA) food grade compliant materials.